Executive Summary - A card that is geared towards those who fly this airline (presumably to Europe) often. Perhaps the best perk is that if you are an elite member (SENATOR and HON level), the annual fee is waived! As a Star Alliance member, card holders will also be able to use their miles (often for no fuel surcharge) on member airlines as well. United and US Airways spring to mind. Lufthansa is the flagship German carrier and in my opinion has one of the best services around. Their affinity card for the US is issued through Barclays and it actually has two versions. Depending on Barclays assessment of your credit, you may be approved for either card. The Miles and More Program is not just for Lufthansa, and but the program of Austrian and Swiss Airlines. Let's look at both versions of the card, starting with the "Premier MasterCard" version. Miles and More Premier MasterCardÂ® - The "Premier Version" (unlike the World MasterCard version) allows you to earn double miles when you use the card to purchase tickets from Lufthansa and their airline partners. These partners include Adria Airways, AirDolomiti, Austrian Airlines Group, Brussels Airlines, Croatia Airlines, LOT Polish Airlines, Lufthansa, Lufthansa Regional, Lufthansa Private Jet, Luxair and SWISS. The annual fee is $79, but if you are a Senator or HON Circle member, the annual fee is waived. Miles and More World MasterCardÂ® - The lower tier version is the Lufthansa Miles and More World MasterCard. This card allows you to earn one mile for every dollar that you spend on the card (yes, that means no double miles). The annual fee for this version is $59. If you are a Senator or HON Circle member of their frequent flier program, then the annual fee is waived. To keep your miles from expiring, you have to use your card once a month. You will be able to receive a companion ticket once a year. Miles and More Platinum MasterCard - If you are approved for neither of the above cards, then you will be approved for the Platinum MasterCard version. This version has no annual fee, but you can only earn one mile for every two dollars that you spend on the card. The sign up bonus is also less, 5,000 miles after the first purchase. Upon every anniversary of the card, you will receive a companion ticket. You will also receive one after your first use (applies to new card holders)! The companion ticket is an economy class ticket and has to be booked on a "class H" seat or higher. Question is how would you know if it is a class "H" seat. 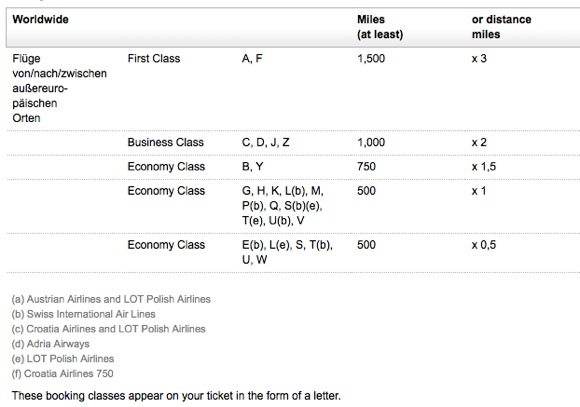 According to this chart (below) provided by Lufthansa, you will know if you are in at least class H if you are credited 100% of the miles that you travel and if it is at least 500 miles that you are going to fly. The flight has to depart from the US to Europe/Middle East/Africa and Far East. That means you cannot use it for inter-European flights when you are there. The flights must also be Lufthansa and cannot be code share flights. To get a rough idea on the savings, I tried to find the fare and taxes for a flight from my state (PA). 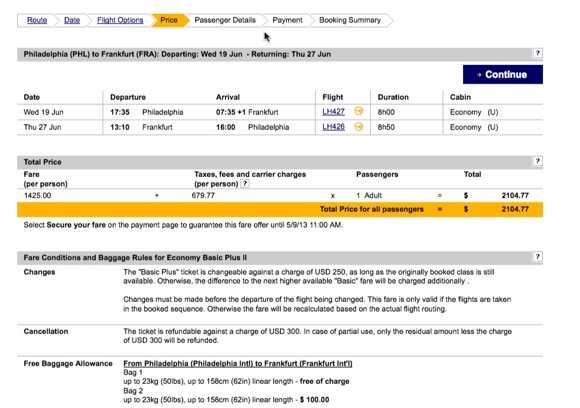 Below is a screenshot of the cost of a flight from Philadelphia International Airport (PHL) to Frankfurt International Airport. The departure date was 6/19/2013 and return date was 6/27/2013. For this flight, the ticket was at least a "H" class as every fare earned at least 100% of mileage (no deep discount fares on this flight). As you can see the cost of just the airline ticket (round trip) was $1,425.00. The taxes and surcharges came up to $679.77. It is important to note that the companion ticket only covers the actual airline ticket cost and not the taxes. So in this case, you would be saving $1,425 if you brought a companion along on this "hypothetical trip". One thing that you have to note is that Lufthansa (or rather Miles and More) is a partner of the Starwood Preferred Guest program. That means that you can earn Starpoints on a Amex Starwood Preferred Guest and transfer them to Miles and More miles on a one for one basis. Furthermore, if you transfer 20,000 starpoints to Miles and More miles, Starwood will give you an additional 5,000 bonus Miles and More miles! The Starwood credit card has a $65 annual fee and allows you to earn one point for every dollar that you spend, but more on Starwood Hotels. I'm mentioning this because under some circumstances, you might also want to be complimenting this card with the SPG Amex. As we explained earlier, the FF program is also the one for Swiss and Austrian Airlines. Since MM is also part of Star Alliance, this means that you can use their points to redeem for flights on any Star Alliance airlines. The one thing to note is that if you redeem flights on Lufthansa (and in fact many of their partners - including Star Alliance), you will have to pay fuel surcharges. On a US to Europe flight, we are talking about $500 for a economy class ticket. Is It Good? Should You Get It? The Lufthansa is a pretty interesting card in a couple of ways. I'll focus in on the premier MasterCard version because most airline credit cards are configured that way - earn double miles, charge an annual fee and give a free annual economy companion ticket. The unique thing about these cards is that if you are an elite member of Miles and More, ie Senator or HON Circle member, you actually pay no annual fee (which is a really good deal). The profile of someone who would get this card is a typical business executive who would be flying airline a lot to Europe. If this describes you, then I think it would make a lot of sense to get this card. The key reason is that even if you do not decide to use the MM miles for their flights, you can always use it on United and US Airways (which have no fuel charges) for either domestic or international flights. For those of you eyeing their sign up bonuses (when it is good), the thing that you have going for you is that the miles are redeemable on domestic Star Alliance partners like United and US Airways and you do not pay fuel taxes on the redemption. Depending on the sign up bonus that you get, this card might or might not be an opportunity for you. If you are a SENATOR or HON member (ie elite members), then I think having this in your wallet becomes a no brainer!